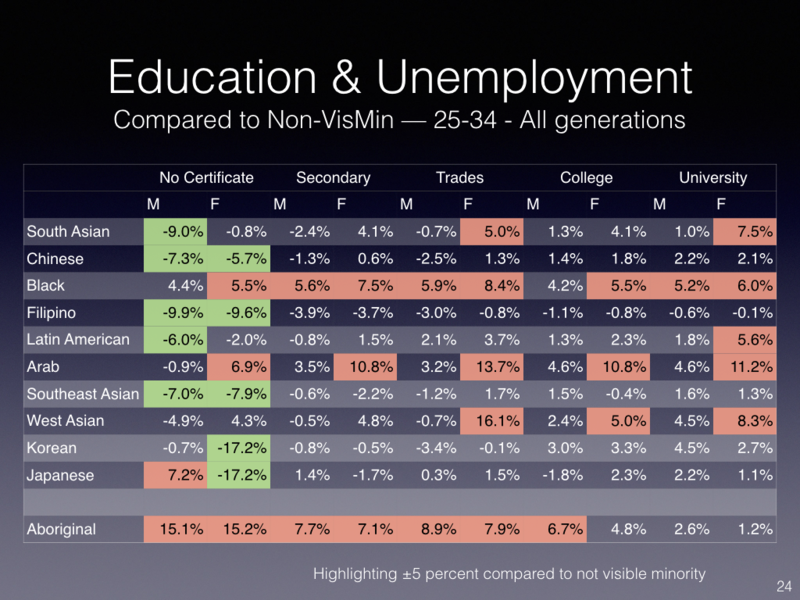 A further nuance to the data presented in the two studies mentioned can be seen in the above chart showing unemployment rates for 25-34 year olds for visible minority groups compared to non-visible minorities by level of education showing generally higher unemployment rates for college and university educated visible minorities (I don’t yet have the data table by generation). ….Contrary to widespread claims that white males are “privileged” in Canada, an earlier study by Picot and Feng Hou, of the University of Victoria, found that Canada’s 3.2 million women of colour are the most educated group in the country. “The children of immigrants from many Asian countries, such as China and India, register remarkably high educational outcomes, with 50 of Chinese and 60 per cent of those from India holding university degrees,” Picot says. When Jedwab zeroed in on the education levels of middle-aged adults in Metro Vancouver, he found 46 per cent of immigrant men and 48 per cent of immigrant women in the city had university degrees. That ratio was 41 per cent for Canadian-born females (between the ages of 35 and 44), and only 31 per cent for Canadian-born males. As well as being accomplished at universities, a high portion of children of immigrants tend to find success once they venture out to work in Canada. The results do not offer good news for all immigrants and their children, though. The studies by Picot and Jedwab show that immigrants to Canada are tending to divide into two polarized groups: Some are unusually strong at the high end of the economic spectrum, others are over-represented at the low end. 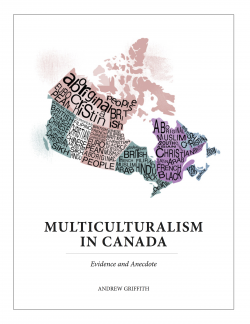 Jedwab found immigrants and visible-minority Canadians are far more likely than the Canadian-born and whites to report low incomes. In Metro Vancouver, for instance, Jedwab found almost 15 per cent of immigrants had low incomes, compared to just 9.4 of non-immigrants. In addition, 24 per cent of Metro’s ethnic Chinese reported low incomes, compared to 10 per cent of non-visible minorities. In an era where some North American academics, activists and media commentators are emphasizing “white male privilege,” the census data raises questions about the usefulness of such a broad concept. It highlights contradictions and disagreements over which groups are privileged and which are disadvantaged. Jedwab, for instance, does not think much of the arguments of those who worry that males who are “non-visible-minority Canadians” (a Statistics Canada category that is largely made up of whites, but also includes aboriginals) are disadvantaged, or under performing. He says many are simply going into blue-collar work. While economists like Collier and educators such as Bennett also appreciate the many positive achievements of immigrants and people of colour, they don’t necessarily want Western societies to abandon the domestic-born population. Bennett, a university instructor who maintains the website Educhatter, is concerned about the “lack of motivation” among average students of Canadian background, including whites and Aboriginals. His research has found many are languishing. Collier says high-immigrant Western countries such as Britain, the U.S. and Canada have never figured out how to address the problems of the under-achieving domestically born. Such countries, he said, have developed either universal programs for everyone, or affirmative-action plans for immigrant, ethnic or other minority groups perceived as vulnerable. No Western country, he suggests, has ever designed a way to respond to the more nebulous needs of those in the mainstream domestic population — whom many consider to be privileged, but who are under-achieving. Is there any chance policy-makers in Canada will be the first to take up the challenge they offer?